I took this pic last night. I'm still unpacking from my trip plus getting ready for 2 classes today. From left to right.... far left my red Cricket and directions for my class. Next are the 4 cards below. Then my open Craftmate with some tools in it. Then my scissors, a label from a package, and my ATG gun. Hopefully my desk will be a bit busier next week as I have 5 Easter cards to get made and in the mail, a couple swap cards done, and some cards ordered for a local Grief Share group. But I'm still recouping from my trip and still trying to get my car back to 100% (it goes back in the shop Friday). Also I want to show you 4 cards we made at the conference using new products that cannot be purchased until June when the new catalog comes out. We played with a "new" technique (I've done similar over the years) using inks on our blocks (top photo, right card and bottom photo, left card). I have to say my fingers were quite colorful, too. Today I'm not home much, I have a class to attend on Bible Journaling and am teaching one on the Waterfall Card. I'll be popping around tomorrow after I get home from work to visit desks and look at projects shared. Hope you head over to the Stamping Ground and enjoy the "tour"!. 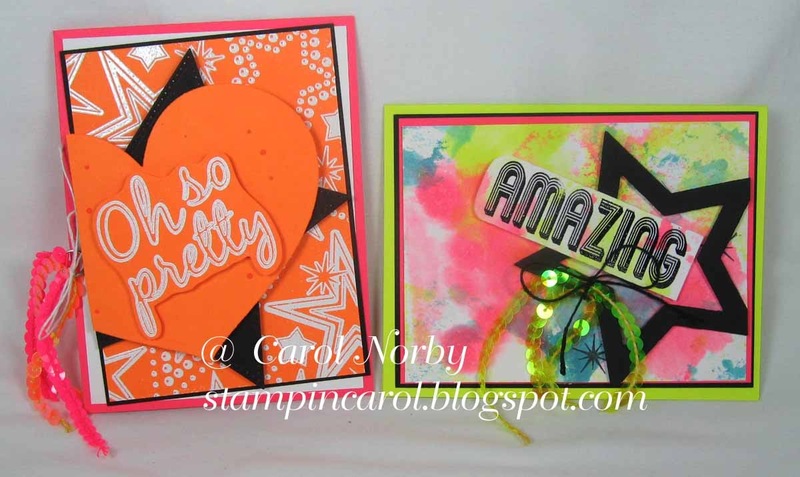 What amazing colourful cards, Sharon. They are great. Trust you have had a good day with your classes. Hope the car is soon back to rights again! Cute cards. Love your little holder for your scissors and tools. Wow you have been busy! Glad you had fun at the show you went to. The cards look fabulous. 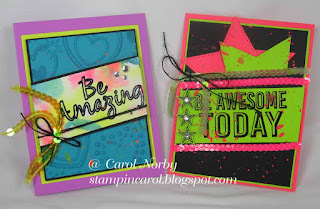 Fun cards, love the bold designs. 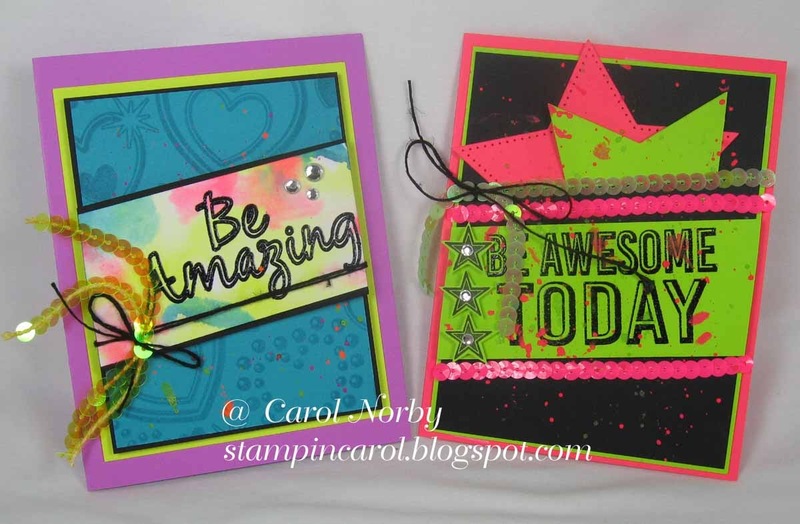 Those are some SUPER FUN cards, Carol! 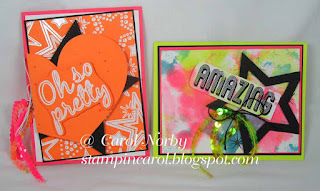 They are great cards, I love the neons. You are really busy, and having the car in the shop is just plain inconvenient! Hope all the workshops go well...a waterfall card is quite an undertaking!